Guys, I think I have a favorite new grilled cheese sandwich. Don’t get me wrong, I’m still fond of my cauliflower crust grilled cheese and of my zucchini crust grilled cheese but this French Onion Soup Grilled Cheese is really special. I think it has something to do with my love for caramelized onions. In fact, I just realized that a good percentage of my recipes call for either partially caramelized onions or super caramelized onions. Especially when I am making something vegan or vegetarian caramelized onions add a much needed umami flavor, such as in this sweet potato hash or on this focaccia. My love for caramelized onions probably explains why I often get cravings for French onion soup more frequently than I like to admit. Still, I don’t make French onion soup quite that often because (1) it’s labor-intensive, and (2) it takes time to make. 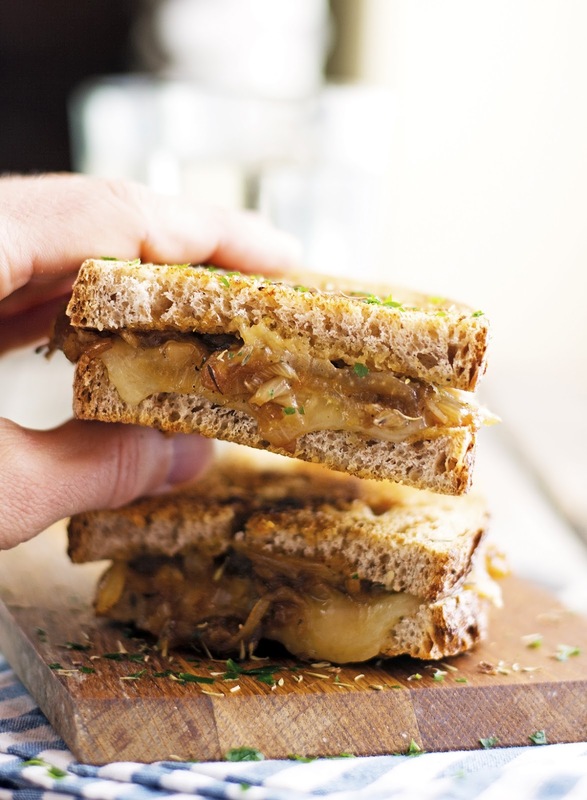 Enters this amazing French Onion Soup Grilled Cheese. It’s the marriage of one of my favorite soups with the ultimate comfort food and it’s a snap to make. Win-win. 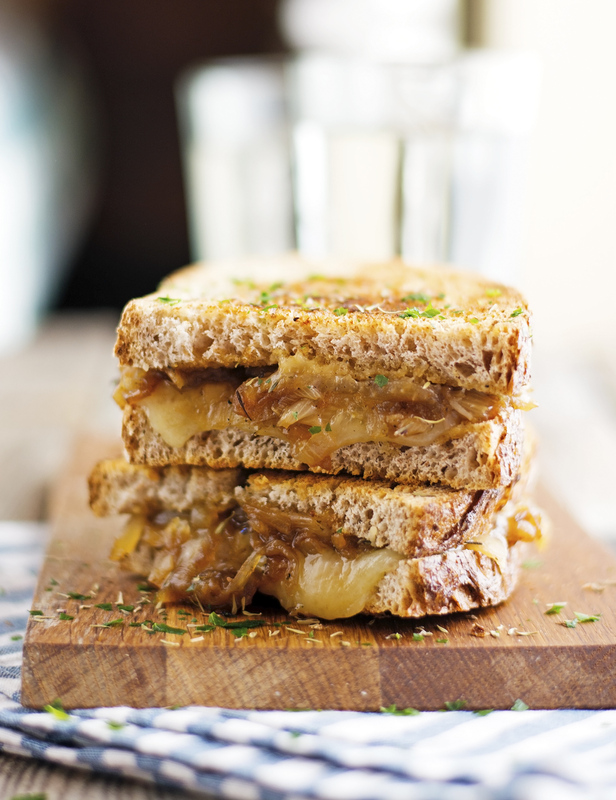 Caramelized onions get shoved with gruyere cheese between golden, toasty, buttery bread: to-die-for. This is an extremely simple recipe that anyone can make. 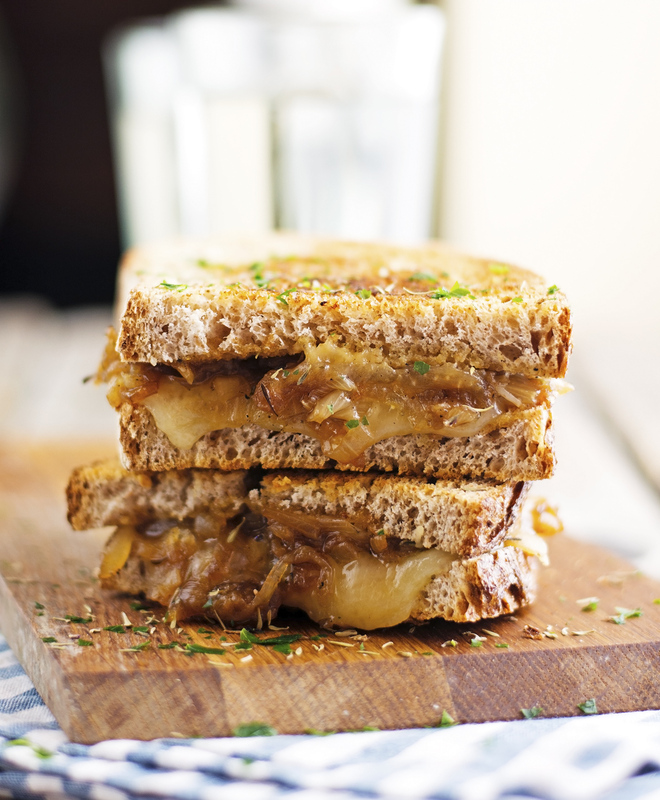 If you love French onion soup you will love this grilled cheese. Trust. French Onion Soup Grilled Cheese Print this recipe! Heat oil in a heavy bottom pan (or cast iron skillet). Add onions and cook, stirring until they soften, about 5 minutes. Add a generous pinch of salt, thyme, and pepper and turn the heat to low. Add beef stock and cook, stirring every now and then, until onions are soft and golden brown, about 20 to 30 minutes. Season to taste with salt and pepper and remove from pan. Wipe the pan with paper towel and set aside. Butter one side of each slice of bread (preferably the top part) with remaining butter. Place one slice of bread in the pan, buttered side down, sprinkle with 2 tablespoons of grated cheese top with half of the caramelized onion, then another 2 tablespoons of grated cheese, sprinkle with parsley, and top with another bread slice, buttered side up. Repeat procedure to make the other grilled cheese sandwich. One grilled cheese yields 413 calories, 26 grams of fat, 28 grams of carbs, and 18 grams of protein.